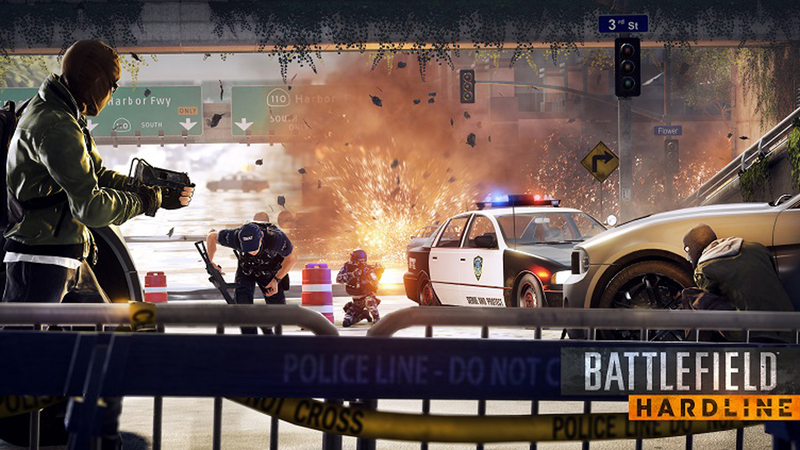 EA’s delayed Battlefield Hardline will be released on March 17th (19th in EU, 20th in UK). In a change for the military FPS series, it’s based on police versus criminals, with a crime story single player mode and multiplayer that sees you on the right or wrong side of the law, fighting the other. Originally slated for a fall 2014 release, Battlefield Hardline has probable been delayed to avoid the terrible problems Battlefield 4 faced last year. In a year of botched online launches for EA, Battlefield 4 was probably the most damaging because it looked like it was on its way to stealing the FPS crown from Call of Duty. Battlefield Hardline claims to be inspired by ‘the most popular crime dramas seen on television today’, so we could expect it to be dark and gritty with muddy moral waters. As ever, the multiplayer modes will be most people’s focus – single player campaigns in modern FPS games are ever decreasing in importance. Call of Duty has often used the single player campaign to generate controversy, as with the ‘no Russian’ level, which saw players take part in a terrorist massacre. The Battlefield series has typically shied away from this kind of thing, but that does beg the question, ‘what is the point of Battlefield’s single player campaign?’ Maybe Hardline’s storyline– set in Miami with cops chasing the supply of drugs to the city– could change this. Check out our impressions of the Battlefield Hardline beta. It will be released on PC, PS 4, Xbox One, PS 3 and Xbox 360.